The cultural expression of India is as varied in style as it is in form and this is due partly to the size of the land, its myriad religions, races, beliefs, customs and its many layered history. The series combines pieces of this splendid mosaic with an eye on the apparent as well as the hidden nuances; on tradition and continuity as well as the winds of change. Indian Textiles have a glorious tradition going back about fifty centuries, nourished by the creative and innovative energies of its craftsmen. 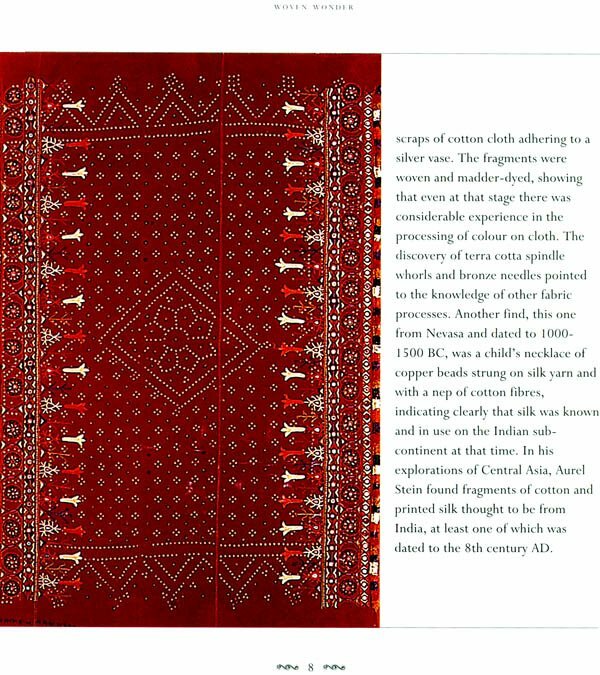 Upto the eighteenth century, no other country in the world produced such an abundance and variety of textiles; at that time India was the largest exporter of textiles. 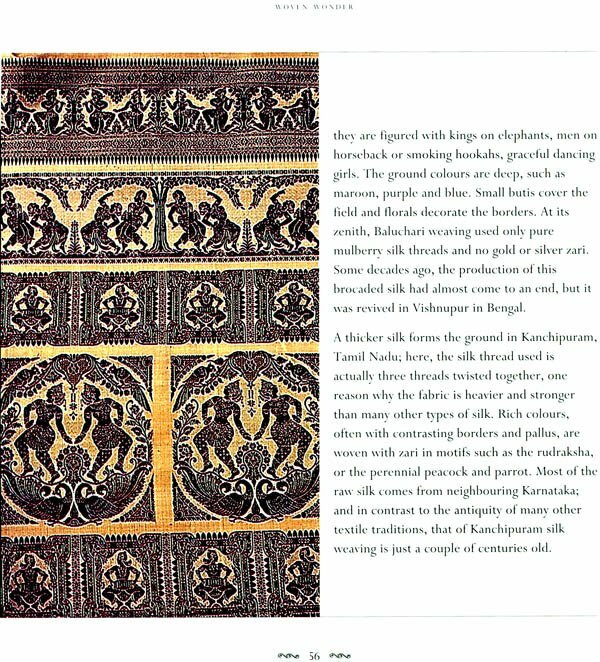 This book briefly traces the story of Indian textiles. 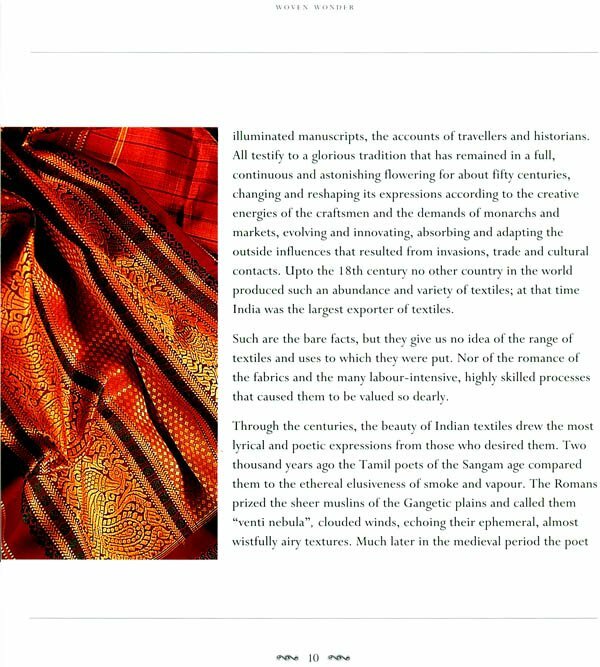 The six sections of the book cover fabrics and the importance of colour; the process of fabrics, their dyeing, weaving and embellishments such as embroidery, brocading and printing; and ends with a fervent plea for the sustenance of this heritage. Lavishly illustrated with colour photographs, including those of rare or unusual museum pieces, this book encapsulates one of the greatest of Indian achievements. Asha Rani Mathur has been associated with both books and music. A freelance writer and editor, she has worked on in flight magazines, edited and produced books on aspects of Indian life and culture as well as art catalogues and written on subjects as far apart as restaurant food and ancient India. She has also scripted documentaries for television. In music, she has been associated with the Music Today label as producer of many of their classical albums and fusion series. 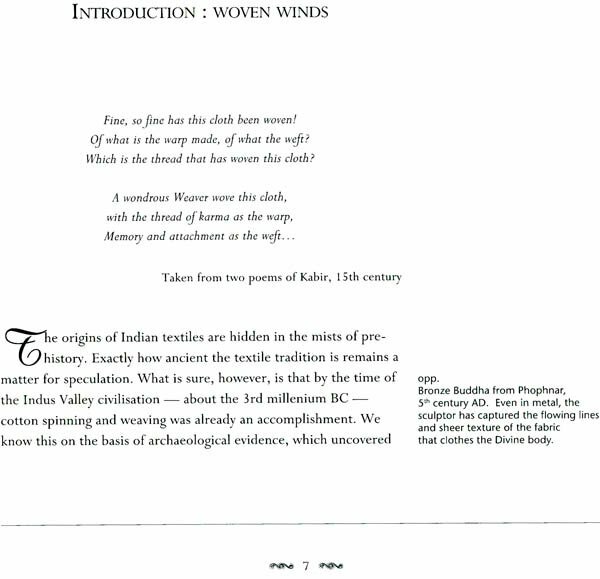 The origins of Indian textiles are hidden in the mists of prehistory exactly how ancient the textile tradition is remains a matter for speculation. What is sure however is that by the time of the Indus valley civilization about the 3rd millennium BC cotton spinning and weaving was already an accomplishment. We know this one the basis of archaeological evidence which uncovered scraps of cotton cloth adhering to a silver vase. The fragments were woven and madder dyed showing that even at that stage there was considerable experience in the processing of color on cloth. The discovery of terra cotta spindle whorls and bronze needles pointed to the knowledge of the other fabric processes. Another find this one from Nevasa and dated to 1000- 1500 B.C. 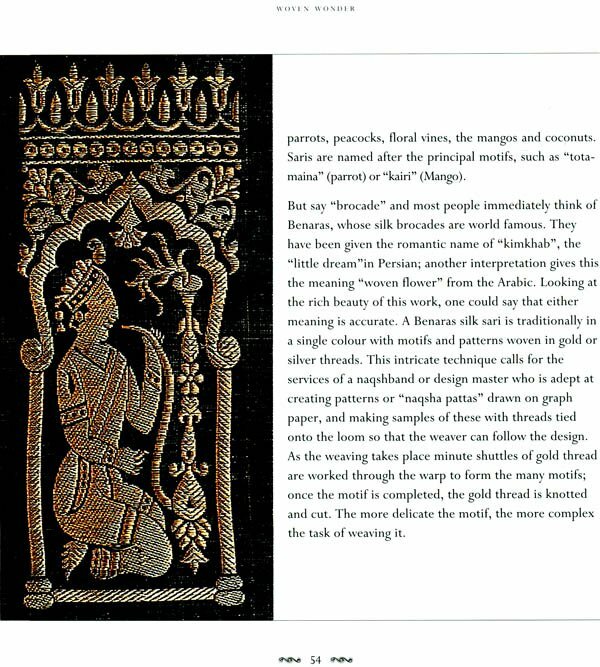 was a child’s necklace of copper beads strung on silk yarn and with a nep of cotton fibres indicating clearly that silk was known and in use on the Indian subcontinent at that time. In his explorations of central Asia, Aurel Stein found fragments of cotton and printed silk thought to be from India at least one of which was dated to the 8th century A.D.
Chronologically the next recorded find were at fostat on the outskirts of the Egyptian capital Cairo. Here archaeologists in search of ancient Roman remains uncovered a Coptic settlement near the ruins of a fort and many bits of cloth some of which were indisputably Indian in origin and dated back to at least the 15th (some believe the 12th) Century A.D. 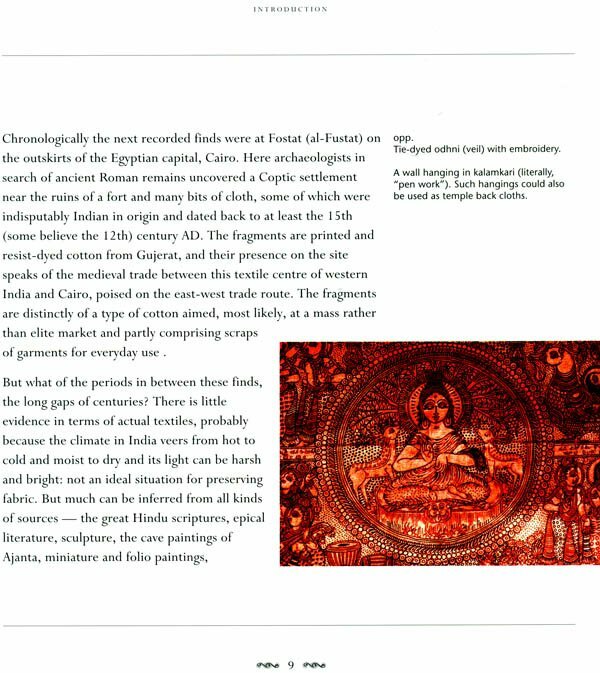 The fragments are printed and resist dyed cotton from Gujerat and their presence on the site speaks of the medieval trade between this textile centre of western India and Cairo poised on the east west trade route. The fragments are distinctly of a type of cotton aimed most likely at a amass rather than elite market and partly comprising scraps of garments for everyday use. But what of the periods in between these finds the long gaps of centuries? There is little evidence in terms of actual textiles probably because the climate in India veers from hot to cold and moist to dry and its light can be harsh and bright not an ideal situation for preserving fabric. 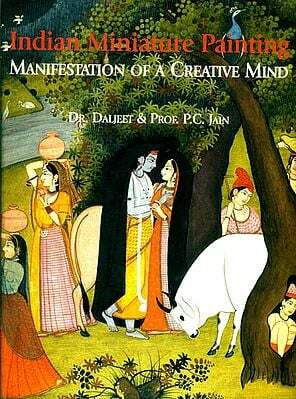 But much can be inferred from all kinds of sources the great Hindu scriptures epical literature sculpture the cave paintings of Ajanta miniature and folio paintings illuminated manuscripts the accounts of travelers and historians. All testify to a glorious tradition that has remained in a full continuous and astonishing flowering for about fifty centuries changing and reshaping its expressions according to the creative energies of the craftsmen and the demands of monarchs and markets evolving and innovating absorbing and adapting the outside influences that resulted from invasions trade and cultural contracts. Upto the 18th century no other country in the world produced such an abundance and variety of textiles at that time India was the largest exporter of textiles. Such are the bare facts but they give us no idea of the range of textiles and uses to which they were put. Nor of the romance of the fabrics and the many labor intensive highly skilled processes that caused them to be valued so clearly. 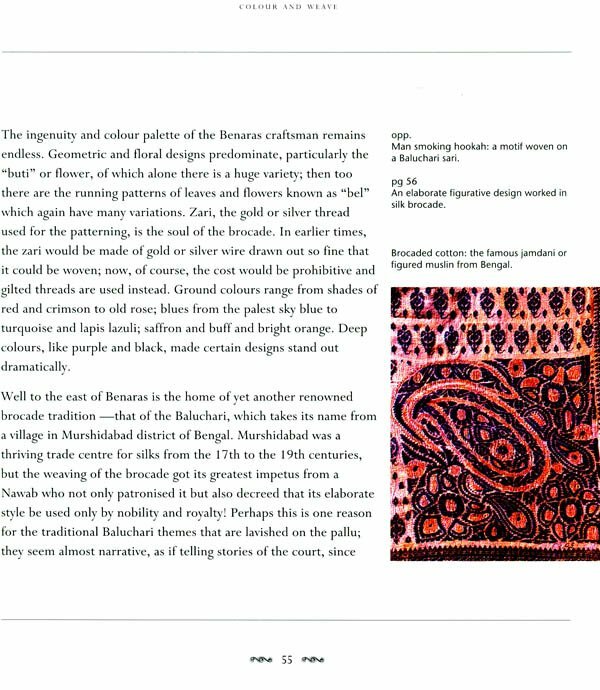 Through the centuries the beauty of Indian textiles drew the most lyrical and poetic expressions from those who desired them. Two thousand years ago the Tamil poets of the Sangam age compared them to the ethereal elusiveness of smike and vapor. The Romans prized the sheer muslins of the Gangetic plains and called them venti nebula clouded winds echoing their ephemeral almost wistfully airy textures. Much later in the medieval period the poet Amir Khusro was to write of the same muslins. A hundred yard of it can pass the eye of a needle so fine is its texture and yet the point of a needle can pierce through it with difficulty. It is so transparent and light that it looks as if one is in no dress at all but has only smeared the body with pure water. Indeed it is said that Zeb-un-nissa the daughter of the Mughal Emperor Aurangzeb was one chastised by her father for appearing without clothes until she pointed out that she had no less than eight jamas or robes!. The words used for muslins were almost lovesick in their yearning descriptions shabnam or morning dew cloth such as was transparent when moistened and stretched over blades of grass in the dawn abrawan running water fabric so fine as to be invisible to the eye when held in the flow of the stream bafthawa woven winds the lightest and airiest of all textures floating forever in the poetic conceit of their own delicacy. The muslins fetched fabulous prices wherever they were sold. Rome Babylon, Phoenicia; also in ancient Egypt where they were used to wrap the bodies of the embalmed and scented mummies. In India the sheerest muslin clothed the Buddha when he attained Nirvana. And when Alexander the Great came to India and Triumphantly accepted the tribute of the Malavas, cotton fabric one of the main offerings. 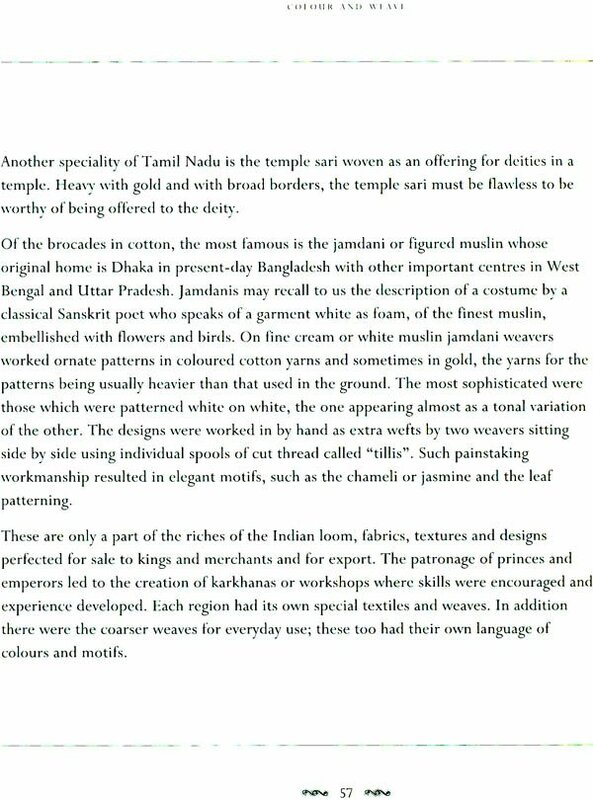 Muslins however formed only a part of the spectrum of India textiles, Traditionally the processing and manufacture of textiles was the second largest occupation after agriculture quite often the two were intertwined. Across the great swathes of textile areas in the country from the banks of the Ganges in the north to Kanya Kumari in the south from Gujerat in the west to Bengal in the east thousands of families spun and wove dyed, painted, embroidered. The range encompassed the finest of cotton silks for kings and their courts and for the affluent as also a variety of work cloths cheaper and coarser textreus for everyday use. Cloth was used for as astonishing variety of purposes for garments for painted wall hangings and traveling tents as bed spreads and canopies, cushions and floor covers and for headgear and robes. Embroidered and beaded it was tenderly placed around the necks of transport animals or used as a conopy to create vivid embellishments for rural carts drawn by camels or bullocks. Woven without flaw and brocaded in gold its perfection was a temple offering to the gods. Made to the demands of users in other countries it formed a staple of trade India’s ancient hard currency earner paid for in precious bullion. So much so that at the beginning of the Christian era the luxury goods of the east the spices, the fine cloths the jewels caused such a drain of gold that the wealthy Roman empire ran into a trade deficit.